Over a century ago, Turtle Soup was earmarked in many a home cook’s favorite cookbook. It is said this was U.S. President Howard Taft’s favorite food. So seriously did he take this dish that he even selected a special chef for the White House who was a master at cooking a good Turtle Soup. Today a small group of restaurants across the country have Turtle Soup on their regular menus. 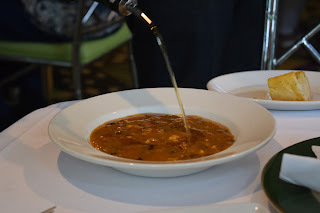 The largest concentration of restaurants with Turtle Soup on their menus is found in America’s foodiest city, New Orleans! Of the dozen or so restaurants in NOLA making Turtle Soup, Commander’s Place is ground zero for this delicacy. Their creole version is thick and stew-like. It is usually topped off at your table with a drop of sherry. No, it does not taste like chicken, but more like a veal stew.